Kiwis love their chips and dip. And the "Original Kiwi Dip" is a concoction made from Nestlé Reduced Cream and Maggi Onion Soup. It’s a recipe older than most New Zealanders and an iconic piece of our culture. But, times change and this classic needed reinvigorating, to combat the wide range of ready-made dips now available to shoppers. So, we altered the packaging of these two products, to create a campaign that didn’t hide from the fact you have to assemble the Original Kiwi Dip; it celebrated it. It pointed out that we New Zealanders have a secret language – a shorthand – that no one else understands. With two simple ingredients we can conjure up an iconic story in a fellow-Kiwi’s head. A policeman and a pie, Suzanne Paul and “thousands of luminous spheres”, Levi Hawken and his broken scooter – New Zealanders know the classic pieces of culture created by putting each of these pairings together without us having to close the loop for them. 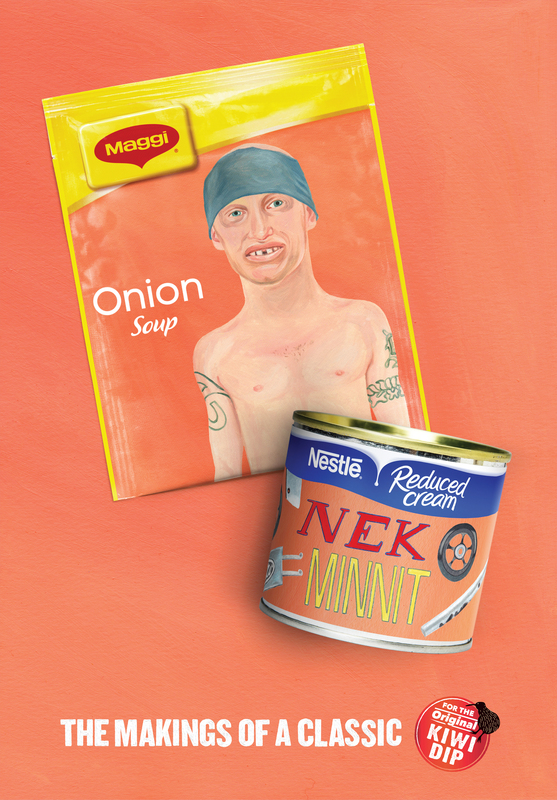 Just like Nestlé Reduced Cream and Maggi Onion Soup… they’re the makings of a classic.